In a city filled with concrete, glass, and steel, it’s a welcome surprise to discover handcrafted rustic benches, bridges, and pergolas in Central Park. Rustic architecture has been an instrumental part of the Park’s design since its creation in 1858, and that tradition continues today. Rustic work, which features unmilled wood, was popular on picturesque English estates by the 1750s. Andrew Jackson Downing, America’s foremost landscape designer in the mid-1800s, introduced his American clients and readers to rustic architecture. 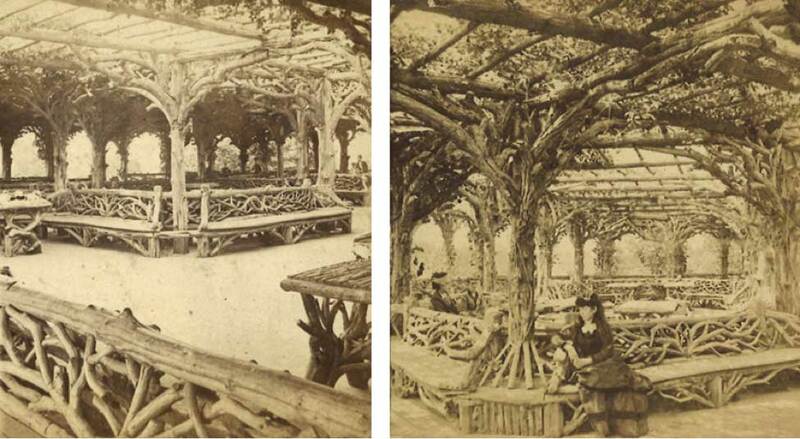 This influenced his business partner and Central Park’s co-designer, Calvert Vaux, who then incorporated rustic work into the Park’s original plan. The largest and most elaborate rustic structure in Central Park was originally the Kinderberg (Dutch for “children’s mountain”). Built in 1866 and measuring 110 feet in diameter, this summerhouse — a rustic wooden structure built for enjoying summer breezes — was designed by Vaux. It included rustic chairs and tables for children and their caregivers. Suffering from neglect and disrepair, however, the Kinderberg didn’t last beyond the 1940s. In 1952, private funds enabled construction of the Chess & Checkers House in its place. Rustic structures require constant upkeep and restoration. For this reason, most of the Park’s original structures disappeared by the 1950s, though visitors can still see evidence of these original rustic designs at the Ramble shelter. The shelter has been renovated with new materials over the years, but its original posts are still standing. The posts are thought to be made with hearty red cedar, which would explain their decades-long endurance. The Conservancy’s dedicated three-person rustic crew — Sam Vargas, Gabe Hernandez, and Rith Hun — continues the rustic tradition, creating original pieces and renovating existing structures. There are currently more than 140 rustic structures in the Park. 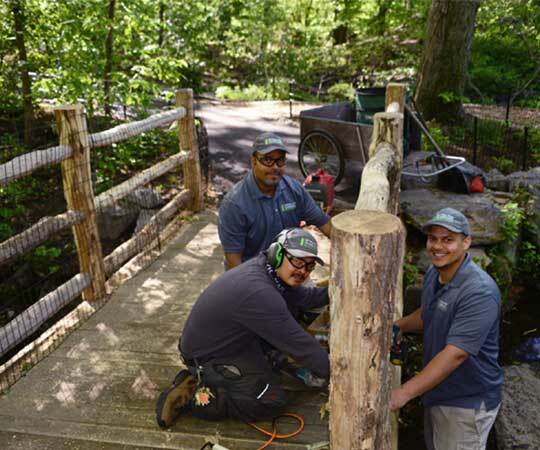 Staff at the Mohonk Mountain House, a New York resort that features the most extensive and varied collection of American rustic work, trained the Conservancy’s first staff members who worked with rustic structures in the 1980s. The Conservancy’s present-day rustic crew’s latest project includes a new bench and two bridges — all made with black locust wood — in the Ramble. Designs for these pieces, and any other rustic pieces in the Park, are created by the Conservancy’s Planning, Design, and Construction team. It’s then up to the rustic crew to make them come to life. For the latest bridge, the crew sawed down pieces of wood to create lattices, then drilled them into place. Their final step on any project is sanding the wood. If you spot a light-colored rustic piece in the Park, you’ve likely found a new addition — the wood gets darker over time. 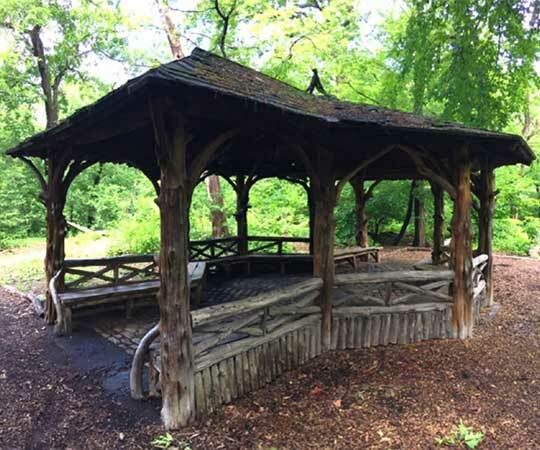 Ramble shelter: Inside the Ramble, which Park co-designer Frederick Law Olmsted called a “wild garden,” you’ll find this structure which features its original 19th-century posts. Hallett Nature Sanctuary: The Park’s smallest woodland landscape recently opened to the public for the first time since the 1930s. 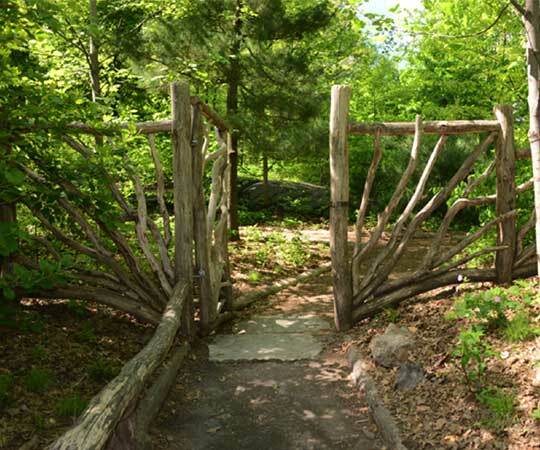 Its hand-crafted, wooden gate acts as a visual transition to welcome visitors to the sanctuary. Don’t miss the Hallett’s scenic overlook which features rustic railings and benches. Cop Cot: The Park's largest wooden rustic structure, this shelter is perched atop a large outcrop at Sixth Avenue and 60th Street. The Conservancy renovated it in 2015 and installed two new sets of rustic benches. Ravine overlook: The Conservancy recently completed a major restoration of the Ravine and Loch, which included the addition of several new rustic features — most notably a stunning scenic overlook. Chambers Landing and Wagner Cove Landing: In 2016, the Conservancy reconstructed five boat landings to be faithful recreations of landings featured in the Park’s original design. These two boat landings showcase the rustic style and provide beautiful views of the Lake. Rustic pieces help support the scenic character of the Park’s landscapes, providing increased enjoyment for visitors and creating an atmosphere reminiscent of the Adirondacks, an original intent of the Park’s design. With the help of rustic architecture, visitors can experience nature and a respite from the City while admiring beautiful, handcrafted pieces of history.